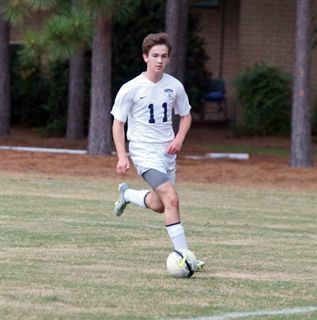 The O’Neal School boys’ varsity soccer team collected a hard fought 4-1 win over Trinity School of Durham and Chapel Hill on Thursday evening. After a resilient comeback road win two days earlier, O’Neal had to come from behind again to earn the victory again. As O’Neal hosted it’s annual on campus, school wide picnic, a bumper crowd was on hand to cheer on the Falcons. The crowd provided the extra support and encouragement needed as O’Neal had to outperform a very strong Trinity team. Two goals each from Spencer Sullivan (2019) and Manny Baningo (2018) lead the way for the Falcons. The back line of Kyle McClelland (2017), Andy Jenkins (2019), Nolan Meese (2019) and Paschal Curlin (2019) played well too, thwarting a rampant Trinity attack. The Falcons move to 4 and 1 on the season. O’Neal plays next at home vs. Grace Christian School of Raleigh, on Tuesday 9/13/2016 for a 4pm kick off.